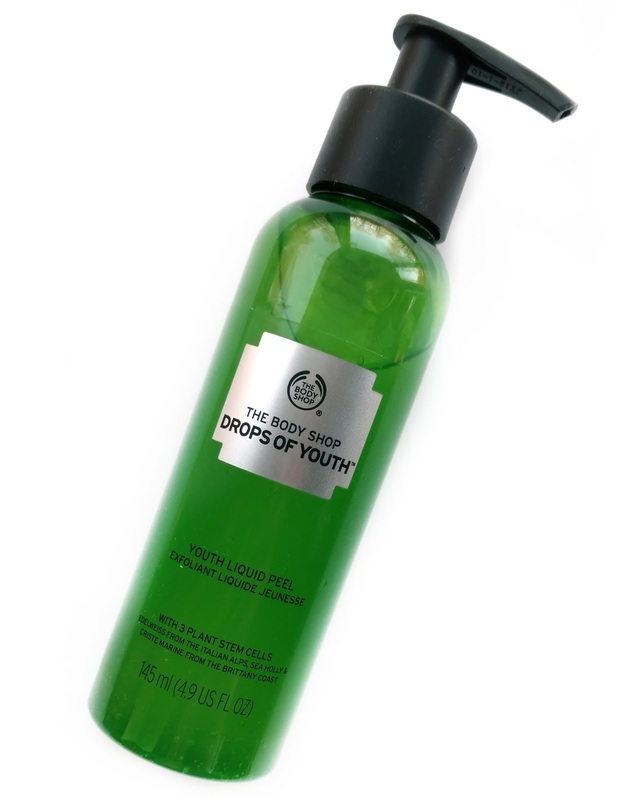 The Body Shop Drops of Youth Youth Liquid Peel ($25) is a brand new exfoliator with a unique twist! It's a gel that turns into a peel as you massage it into your skin, lifting away dead skin cells, dirt, and any makeup that your cleanser left behind. 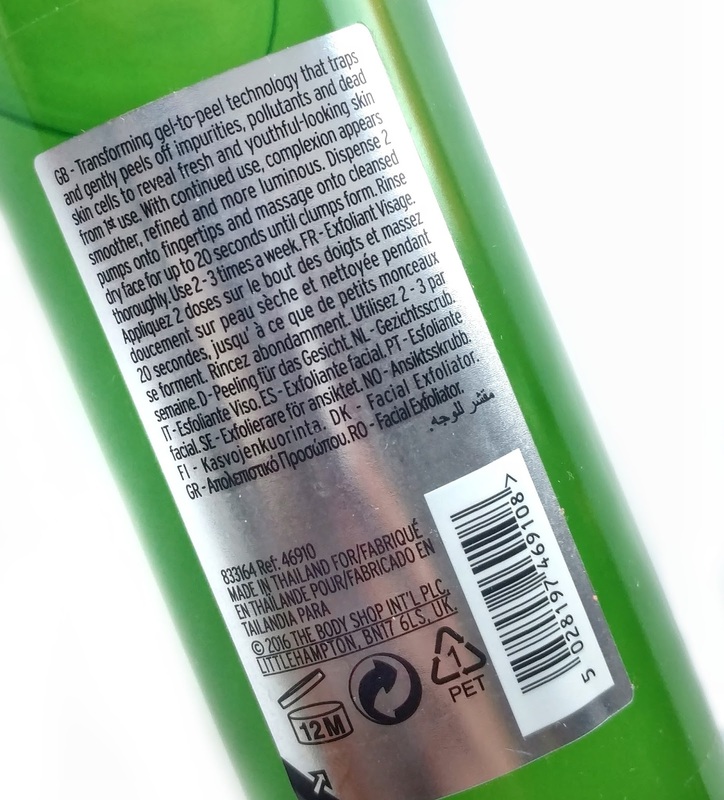 The Body Shop was kind enough to send me a bottle ahead of the launch to review for you guys and after using it for several days now, I'm ready to let you know my thoughts. The NEW Drops of Youth™ Youth Liquid Peel exfoliates and gently peels off impurities from your skin, lifting dead skin cells and residuals. This revolutionary gel-to-peel leaves skin feeling clean and purified from the day’s pollutants. Continued use will leave a fresh, smoother and more luminous youthful-looking skin. The Youth Liquid Peel comes in a bright green pump bottle, similar to a facial cleanser. It's meant to be used after cleansing/makeup removal on dry skin (and is not supposed to be used in the eye area). 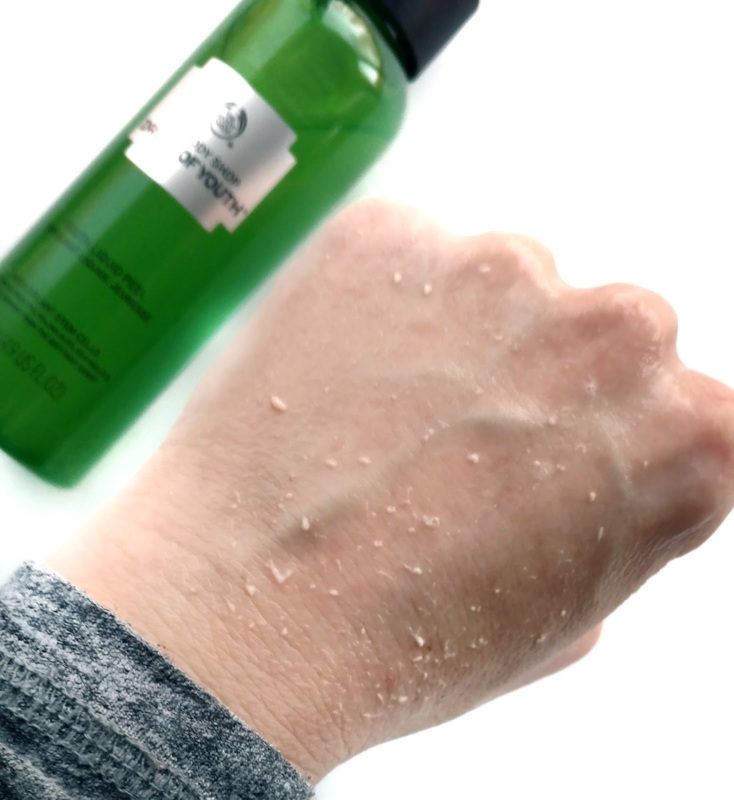 When you first pump some into your hand, it looks like an ordinary clear gel cleanser, but as you start to massage it into your skin, it balls up into little clumps after about 20 seconds, taking all sorts of impurities with it. At first, the skeptic in me thought that it wasn't actually my dead skin cells balling up but just the cleanser itself as it was drying down. However, I tested this theory by trying it a second time and the next time around, it hardly balled up at all. Basically, it only does so if it has something to "grab onto" such as leftover makeup residue, dirt, or dead skin. Also, when I looked closely at those little clumps, they looked a little dingy, so my cleanser clearly doesn't remove everything...yuck! Here's what it looked like when I tried it on my hand...see all that dead, dry skin coming off with the cleanser? It didn't irritate my skin at all, and was gentler than using a scrub...my face didn't have the usual pink "glow" that it gets after using something more abrasive. However, I should mention that it does contain alcohol pretty high up on the ingredient list, so if you're sensitive to alcohol, you might want to avoid this product. It also has a very light, fresh scent that didn't bother me at all, but again, if you're sensitive to fragrance, I wanted to let you know that it's in there. 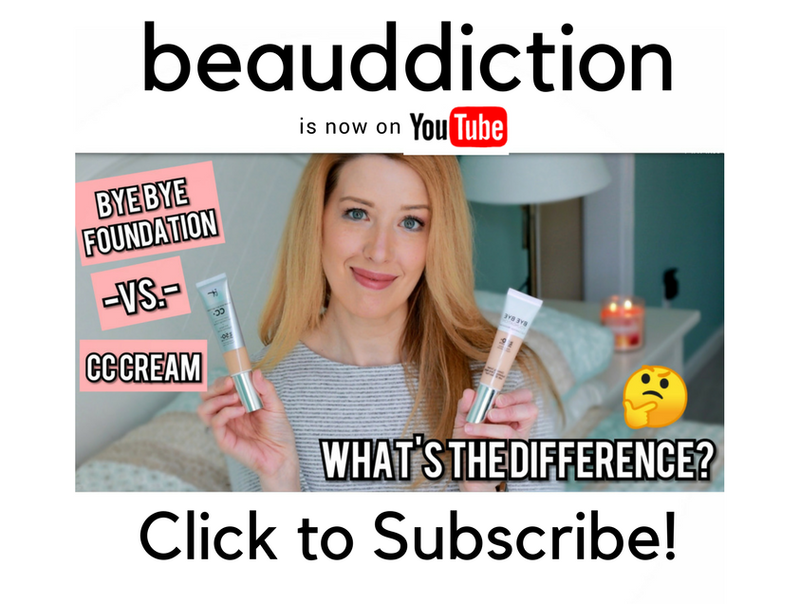 The good news is, even with the alcohol in the formula, it didn't leave my already dry skin feeling any drier using it only twice a week (which is recommended)...in fact, after using it my face felt very soft, smooth, and squeaky clean! It seemed to get rid of whatever grime my cleanser had left behind which is such a satisfying feeling. This is such a fun way to exfoliate! If you're like me and you get satisfaction from actually seeing your skin shedding its dead skin cells, you'll love the Youth Liquid Peel. Grab yours now at TheBodyShop-USA.com...right now they're offering free shipping on orders of $50 or more! Have you ever used the Real Chemisty Peel? I wonder how they compare, it's also a gel like formula that creates little "balls" of dead and dry skin. I love it and it leaves my skin feeling awesome buts it's around $40 for a full size. If they're comparable, I'd switch to save money! This sounds awesome! And such a generous amount of product for the price. If you want similar, but more gentle product with out alcohol, try K-Beauty brands like Tony Moly Brightening Peeling Gel :) Have you tried The Ordinary skin care already? Would love to see your review? For example their Lactic Acid+HA sounds like great more inexpensive dupe for Paula's Choice..